Contains no artificial sweeteners. Ya! 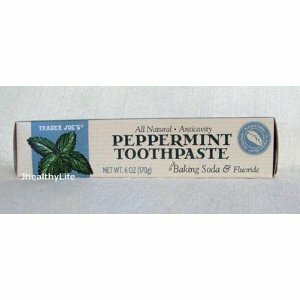 one of my goals with a natural toothpaste! No Sodium Laurel Sulfate Sweet! Also on my list! Active Ingredient: Sodium Monofluorophosphate .76% – anticavity toothpaste This doesn’t sound very natural but it’s basically fluoride. I think for now I’m ok with using a fluoride toothpaste for me and my husband. Baby’s toothpaste is fluoride free. Inactive ingredients: Calcium Carbonate, Glycerin, water, Sodium Bicarbonate, Sodium Stearoyl Lactylate, Hydrated Silica, Menta Piperita (Peppermint) oil, Sodium Cocoyl Glutamate, Chrondos Crispus (Carrageenan). All Natural. No animal testing. No animal products. I like that. Glycerin – This one confused me somewhat. Again, according to wikipedia, glycerol is largely created as a by-product of soap making. I don’t understand how this is natural. Sodium Bicarbonate – Baking soda…I’ve often wondered why this is considered natural. Apparently it is commonly extracted from the ashes of many plants but is synthetically produced in large quantities for industry. I wonder where the sodium bicarbonate in my toothpaste came from.. Sodium Stearoyl Lactylate – A foaming agent and sugar replacer that is non-toxic, biodegradable and safe. But I don’t see how it’s natural either. My gut tells me it’s better than SLS and artificial sweeteners, though. Hydrated Silica – Found in opal. Used as an abrasive to clean away plaque. Chrondos Crispus – Irish Algae used as a thickening agent. Some of the same suspects but way more chemicals, especially in the inactive ingredients. I’m glad I don’t swallow too much of this stuff.